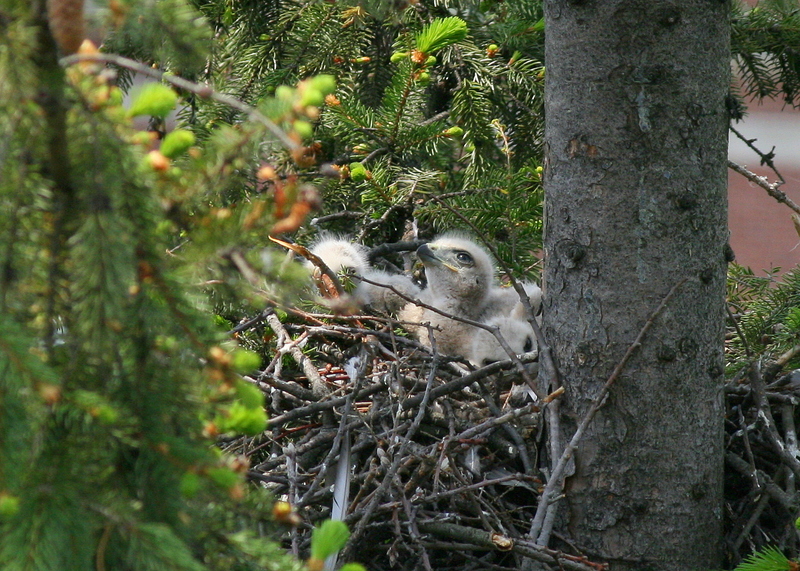 The Red-tailed hawk chicks now number 3! two are larger in body mass than the third smaller one, so time will tell if the third chick is strong enough to make it in the fight for food. According to Birds of North America the male provides most of the food for the female and their brood from hatching, although female may occasionally vacate the nest for brief hunts. For the first 4–5 wk after hatching, prey is torn into small pieces for nestlings by the female; thereafter prey is deposited in the nest for nestlings to tear and eat. Generally, prey are delivered to nestlings 10–15 times/d from just before sunrise to just after sunset. Delivery rate and prey biomass vary among individual birds and are affected by brood size and prey availability.